Our Forklift/Powered Industrial Truck Safety online training course has been specifically created to involve employees in the process of understanding forklift operation and to help facilities in fulfilling the OSHA Powered Industrial Truck Standard (29 CFR,1910.178) training requirements. To view a free preview please register on our online safety LMS platform. 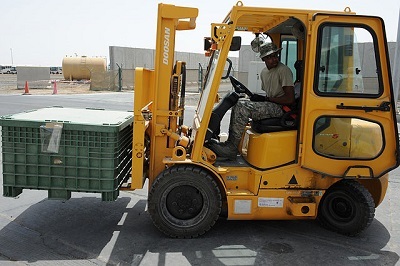 A US Airman transports equipment via forklift June 8, 2012. Owens is deployed to the 380th ELRS from Eglin Air Force Base, Fla. There are many types of powered industrial trucks. Each kind different operating hazards. As an example, a sit-down, counterbalanced high-lift rider truck is more likely than a motorized hand truck to be involved in a falling load accident because the sit-down rider truck can lift a load much higher than a hand truck. Workplace type and conditions are also factors in hazards commonly associated with powered industrial trucks. For example, retail establishments often face greater challenges than other worksites in maintaining pedestrian safety. Beyond that, many workers can also be injured when (1) lift trucks are inadvertently driven off loading docks; (2) lifts fall between docks and an unsecured trailer; (3) they are struck by a lift truck; or (4) they fall while on elevated pallets and tines. Determining the best way to protect workers from injury largely depends on the type of truck operated and the facility where it is being used. Employers must ensure that each powered industrial truck operator is competent to operate a powered industrial truck safely, as demonstrated by the successful completion of the training and evaluation specified in 29 CFR 1910.178(l)(1). In the U.S., workplace forklift training is governed federally by OSHA the Occupational Safety and Health Administration. In 1999, OSHA updated it's 29 CFR 1910.178 regulations governing "Powered Industrial Trucks" (the term OSHA uses to include forklifts among other types of industrial vehicles.) A major component of these regulations deals with forklift operator training. The standard requires employers to develop and implement a training program based on the general principles of safe truck operation, the types of vehicle(s) being used in the workplace, the hazards of the workplace created by the use of the vehicle(s), and the general safety requirements of the OSHA standard. OSHA believes, that trained operators must know how to do the job properly and do it safely as demonstrated by workplace evaluation. Formal (lecture, video, etc.) and practical (demonstration and practical exercises) training must be provided. Companies must also certify that each operator has received the training and evaluate each operator at least once every three years. Prior to operating the truck in the workplace, the employer must evaluate the operator's performance and determine the operator to be competent to operate a powered industrial truck safely. Refresher training is needed whenever an operator demonstrates a deficiency in the safe operation of the truck. — The tractors that pull luggage carts at airports. — The all terrain reach-trucks operated on construction sites. • All of these vehicles save us time, money and effort. — But if they are not used correctly or maintained properly they can be dangerous. • OSHA's Powered Industrial Truck Standard covers how to work safely with these machines. — One of the most significant parts of the regulation deals with training. • Before you can use any type of Powered Industrial Truck, OSHA requires that you be fully trained, evaluated and certified by a competent instructor. — Instruction on safety procedures. — Training on how to operate the industrial trucks that you will be using. • Your knowledge and ability will be re-evaluated at least once every three years. — If necessary, you will undergo retraining at this time. — Are observed being unsafe. — Have a close call. — Are involved in an accident. • In addition, retraining is required whenever there is a change in your workplace that may affect your ability to operate a Powered Industrial Truck safely. • To help you choose the industrial truck that is right for your job, OSHA has separated them into seven classes. • Classes One through Five are Forklifts and other lift trucks. — These machines often have massive counterbalance weights that allow them to lift heavy loads. • Class One Trucks are counterbalanced Forklifts powered by electric motors. — Since these machines do not produce exhaust gas, they are a good choice for use inside warehouses and other buildings. • Class Two are narrow-aisle lift trucks and order pickers. — Some of these machines actually raise the operators to where they can easily reach materials. — Fall protection must be worn by workers using this equipment. • Class Three are electric-powered hand trucks that operators either walk behind or lead. — Even though you do not drive these machines, you must still be properly trained before you use them. • Class Four machines are outfitted with solid rubber tires, so they can only be used on paved surfaces. 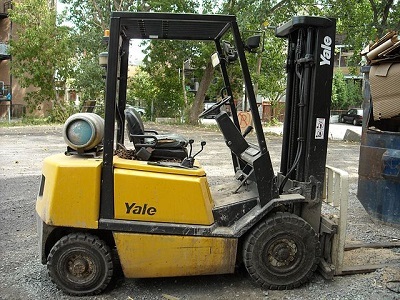 — Class Five Forklifts have pneumatic tires, which allows them to drive on unpaved surfaces. • In addition to these classes of general industry lift trucks, OSHA recognizes two other distinct types of vehicles as Powered Industrial Trucks. • Class Six are tractor-like machines, such as the vehicles that pull luggage carts at airports. — Since these do not lift loads, like Forklifts, they are not counterbalanced. — This makes them lighter and somewhat easier to drive. • Class Seven are counterbalanced, rough-terrain Powered Industrial Trucks. — Unlike other lift trucks, Class Seven machines have booms that allow them to pick up and place materials in difficult to reach locations. — Additional training is required to operate these machines safely. • If you operate one of these vehicles, talk to your supervisor about training requirements. • While each type of Powered Industrial Truck has its own specific characteristics, there are some general rules to follow when dealing with any of them. • Begin each day by giving your truck a once-over. — A vehicle used around the clock should be checked after each shift. — If you find something wrong, take the key out of the ignition and put a sign on the vehicle that identifies it as "out of service". — Then inform your supervisor of the problem. • Create a checklist for your inspection. — Start with the exterior. — Make sure moving parts operate correctly, and safety guards are not bent or broken. • The air pressure in pneumatic tires must be kept up to specification. — Solid tires should not have any gashes or embedded debris. • Check the hydraulic controls and oil level. • Examine batteries for leaks and corrosion. — Make sure that cable connections are tight. • On electric powered trucks, test the battery's electrolyte level and specific gravity. — Remember to wear personal protective equipment. — Eye protection, face shields and rubber gloves are mandatory whenever you work with battery acid. • "I.C. ", or Internal Combustion engine industrial trucks, run on propane, gasoline or diesel fuels. — These models require yearly emission tests, similar to the ones performed on automobiles. — Verify that I.C. powered vehicles have passed this test before you use them. • Recharge and refuel only in designated "No Smoking" areas, away from flames, sparks and electric arcs. — This must be done even with an electric powered industrial truck, because the batteries can give off highly flammable hydrogen gas. • Before recharging an electric powered industrial truck, raise the hood and leave it open while the battery is charging. — This will reduce the chances of an explosion, by allowing any hydrogen gas that is generated during the charging process to dissipate. — Leave the charger off until you have connected it to the battery, so that you don't generate any sparks. • Take the charger's plug in one hand, and insert it into the battery's plug using your other hand. — Plugging the charger directly into the truck will not recharge the battery, and may even damage electric components. — Once the cables are properly connected, you can turn the charger on. • After the battery is charged, turn the charger off before you disconnect the cables. — Then make sure that the hood is securely repositioned and locked. — This will keep the battery from slipping out of its compartment if the truck ever tips over. • When refueling a propane powered industrial truck, first shut off the engine. — Then turn off the valve to the tank, unscrew the line and roll the empty tank off the truck. • Position the tank by aligning it with the tank locating pin. — This puts the fuel pickup tube inside the tank at the best angle to withdraw the propane. — Secure the tank in place, hand tighten the fuel line, and open the valve. — Once your vehicle has passed inspection and been fueled, you're ready to work. • Whenever you are operating a Powered Industrial Truck, follow safe operating procedures. • Begin by entering the vehicle properly. — Use a three-point mount. — Make sure that you have at least two hands and one foot, or two feet and one hand, in contact with the truck at all times. — This will help keep you from slipping. • Before you drive off, adjust your seatbelt and buckle up. — While you're moving, keep your hands inside the vehicle. — Watch where you are going. — Look out for hazards. • If you are driving a Forklift, keep the forks low... four to six inches from the floor. — Raised forks can damage equipment and injure coworkers. • Maintain safe speeds to avoid accidents, and don't stop abruptly when you're carrying a load. — The sudden jolt could cause you to lose the load. • Drive to the right of oncoming traffic and pedestrians, just as you would in a car. — Stay at least three truck-lengths from other vehicles. • Stop and sound your horn at corners and doorways to alert other drivers or anyone on foot. — Look both ways before you pull out. • If you are moving a load that blocks your forward vision, drive in reverse. — Use a spotter to help you, if necessary. • Drive carefully, and never fool around while operating an industrial truck. — The life expectancy of a showoff is not high. • Be careful crossing wet and icy surfaces. — Stopping or turning suddenly could cause you to skid out of control. • Never allow riders on any industrial truck, unless it is specifically designed for transporting passengers. • If you are working indoors with a truck that has an internal combustion engine, make sure there is plenty of ventilation to remove exhaust fumes. — You can improve air flow by turning on fans and opening doors and windows. — In areas where the ventilation can’t be improved, use electrically powered vehicles. • Because Powered Industrial Trucks can generate heat and sparks, they can be dangerous to use around flammable and explosive materials. — To combat this, some trucks have safety features added to the exhaust, fuel and electrical systems that prevent them from igniting these substances. • To help you determine which trucks are safe to use around various materials, OSHA has separated them into eleven categories. — These designations are marked on the nameplates of each truck, along with information such as classification, weight and lifting capacity. — By referencing Table N-1 in OSHA’s Powered Industrial Truck Regulation (CFR 1910.178), you can see which trucks OSHA has approved for use around different types of hazardous materials. — Talk to your supervisor if you have any questions. — The distance to overhead pipes and duct work (you don't want to get stuck, or cause any damage). — Put the engine in neutral. — Set your parking brake. • If you are driving a Forklift, lower the mast to the ground. — This will keep it from moving. — Shut the power off. — Take the key with you. • Be sure to block your wheels when parking on a slope. — Runaway industrial trucks are dangerous. • When parking, make sure that you don't block stairwells, exits or fire hydrants. — They may be needed in an emergency. • If you need to talk to someone who is operating an industrial truck, do not get too close. — The truck could move unexpectedly and run right into you. — Stand off to the side, at least three feet away, and face the operator so that you can see if the vehicle begins to move. — Never put your feet, hands and fingers in places where they could be crushed or amputated. • Although all industrial trucks have similar basic operating procedures, Forklifts have special handling requirements. — One reason for this is their tremendous lifting capacity. — The secret behind this strength is the counter- balance weight in the back of each machine. — This weight prevents a Forklift from tipping forward when you pick up a load. • A loaded Forklift is like a see-saw. — The front wheels are the fulcrum upon which the machine is balanced. — If a load is too heavy, or too far from the fulcrum, the Forklift is likely to tip forward. • Check your Forklift's nameplate to learn the lifting capacity. — Always use a machine that is rated to handle the load that you want to move. • If you are working with pallets, space the forks widely apart to better balance the load. — Keeping the forks level, and a few inches off the ground, move forward slowly until the pallet is seated all the way back on the forks. — Once the forks are fully inserted, slowly lift the pallet about six inches. — Then tilt the mast back to secure the load for transport. • If you are lifting a pallet from an overhead rack, make sure that you lower the mast before traveling with the load. — A Forklift with a raised load is extremely unstable. — If you try to drive with the load in this position you are likely to tip over. • Some loads may be naturally off-center. — Be sure that they are stabilized before moving them. — Find the load's center of gravity, and position the forks accordingly. • Special attachments can be installed on the masts of Forklifts to move barrels, carpet and other hard to grasp objects. — Since these attachments can radically change the lifting capacity of a Forklift, a nameplate with revised specifications must be installed on the vehicle. • Forklifts can even be used to elevate workers, but only with proper safety platforms that are securely fastened to the mast. — Never drive a Forklift with someone on a platform. — Moving it even a few inches is dangerous, because workers could fall or be crushed. • When driving a Forklift you need to remember that they are not as stable as a car. — Most Forklifts are supported only at three points. — On three-wheeled machines the first point is the rear wheel. — On four-wheeled Forklifts it is at the center of the rear axle. — The second and third points are the front wheels. • This three-point suspension forms what is called the "Stability Triangle." — Because a Forklift is designed to handle loads, when it is not carrying anything its center of gravity falls towards the back of the Stability Triangle, close to the first point of support. • Since this is near two of the Triangle's edges, it doesn't take much to cause the Forklift to become unstable. — In fact, just running over a two-by-four can push the center of gravity outside the Stability Triangle, causing the vehicle to tip. • When lifting and carrying a load, the center of gravity will shift towards the front of the Forklift and the second and third points of support. — Since the center of gravity is now between these two points, well away from the sides of the Stability Triangle, the Forklift is generally more stable. — But if a load is too heavy the center of gravity can shift out of the Stability Triangle. — This can cause the Forklift to tip forward, and make it hard to control the steering. — In a worst-case scenario, you may even lose a load... or damage the Forklift. • Another aspect of the Stability Triangle involves the Forklift's vertical stability line, or "Line of Action." — This is an imaginary vertical line that runs through the Forklift's center of gravity. — As long as the Line of Action falls within the Stability Triangle, the Forklift will be stable. — The placement of the load on the forks. — How high the load is raised above the floor. — The angle of the floor beneath the Forklift. • Remember, any load will change a Forklift's center of gravity. — To stabilize a Forklift when driving with a load, the best bet is to tilt the mast back and keep the forks low. — Brace your feet, grab onto the steering wheel and pull yourself tight up against it. — Lean in the opposite direction from the way the vehicle is tipping. — Do not try to get out of the Forklift until it has come to a complete stop. • Most Forklifts and some other Powered Industrial Trucks have rear-wheel steering. — Be careful going around corners (with a Forklift both the forks and the rear of the vehicle will swing wide). — Be especially cautious when turning on a loading dock, so that you don't fall off. • Cross curbs and railroad tracks slowly and at an angle. — This will keep at least two wheels in contact with the ground at all times, and prevent the Forklift from tipping over. • You also need to pay special attention to slopes and ramps. — When transporting a load, always keep the forks (and the load) uphill. — This means you should back down a slope. — Otherwise, you could lose the load. • If you are not carrying a load, the opposite is true. — Always keep the forks pointed downhill to maintain the Forklift's balance. — This also gives you better control of the Forklift, since it puts more of the weight on the front drive wheels, where the brakes are located. — Clear any obstacles in your path. — Check the ramp for puddles, ice or snow. • There should be nothing at the top or bottom of a ramp that could make a vehicle slip or tip. — Be especially careful on steep inclines. • There are some lift trucks that should only be used on flat surfaces. — Consult your Operator's Manual or talk to your supervisor if you have any questions. • Always watch your speed. — Don't let a Powered Industrial Truck accelerate if you are maneuvering down an incline. • Never travel across a slope at an angle... with or without a load. — Driving across even a slight grade can cause a Forklift to tip. • Many of the ramps you will encounter are made of concrete. — If you are using a temporary ramp, like a metal bridgeplate, make sure that it is securely positioned and can handle the weight of both the Forklift and the load. — Set the vehicle's brakes. — Check the strength of the floors, as well (don't forget to look for indentations and holes which could cause your Forklift to tip). • Once you have reached your destination, you need to follow correct procedures for unloading the materials that you are carrying. — Push straight ahead until the load is a few inches short of the drop-off point. — Then tilt the mast forward, so the forks are parallel to the floor and the load is directly over where you want it to land. • Gradually lower the forks until the load is in place and the forks move freely. — When you back away, do it slowly. — Don't drag the forks across the floor. • Materials are often placed in pallet racks, or stacked, to save space. — Ask your supervisor how high you can safely stack the materials you handle. • Whenever you are loading or stacking, make sure that other workers and pedestrians are a safe distance away. — You never know when a load might slip. • Powered Industrial Trucks are valuable tools, that give us the strength to move heavy materials. — But if they are not properly maintained or are used incorrectly, they can be deadly. — To stay safe, we need to know these vehicles inside and out. • Read your truck's Operator's Manual and refer to OSHA's Powered Industrial Truck Standard (29 CFR 1910.178) for proper operating procedures. • Examine your work environment, and choose the type of industrial truck that's right for the jobs you will be doing. • Inspect your truck thoroughly... before you use it. • Pay attention to your machine's weight capacity, and maintain the stability of your vehicle so it doesn't tip over. • Stay alert... and drive safely. • And always make sure that other workers are a safe distance away whenever you are operating an industrial truck. • Powered Industrial Trucks are formidable machines that can be dangerous. But by using common sense... and following correct operating procedures... you can harness their strength and use them safely!